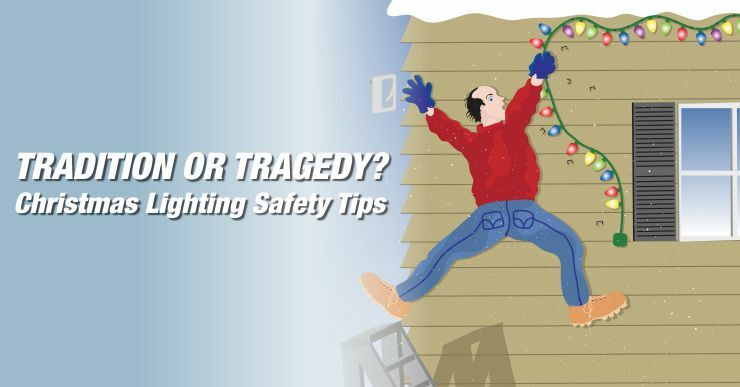 Hanging Christmas lights seems like your run of the mill holiday tradition… but schlepping all those lights and decor up a ladder is actually as dangerous as it is tedious. Each holiday season we see almost 15,000 holiday decor related injuries across America. Most homeowners aren’t taking the proper safety precautions while working with or near electrical equipment, and don’t even get me started on ladder safety! “I was just hanging Christmas lights at my mom’s house like I do every year,” Miller said. “Only this time, I was decorating a new area—the trees that lined the front of the yard.” As he tossed lights up into the trees, 7200 volts of electricity entered his body, traveling from the overhead power lines through his strand of lights. He suffered 27 exit wounds and the loss of his left hand, among other injuries. 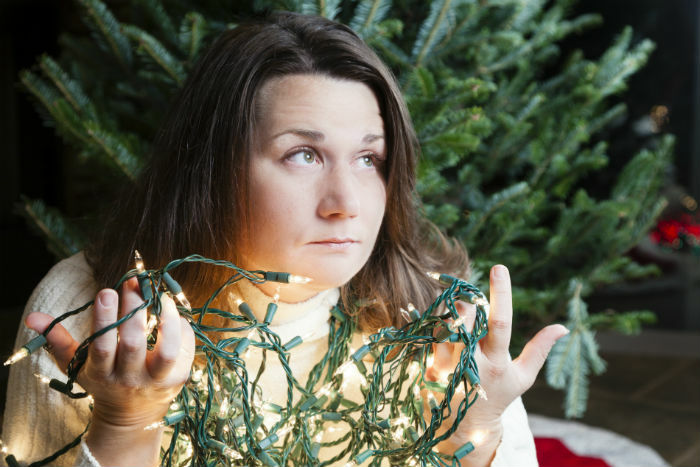 Check each strand of lights before you hang them. Look for any cracked chords, frayed ends or loose connections before you plug it in to avoid a flare up or surge. Ditch any antiquated lights that are still outfitted with old hardware. New lights have fused plugs that stop sparks from shooting out in the case of a short circuit, and this fundamental safety feature could save your life! Be mindful of the common interaction between electrical lights and tinder-dry trees; both inside and outside the home. Christmas tree fires occur each year, and account for about 14 deaths annually.Keep your indoor Christmas tree well-watered at all times to avoid this safety hazard. Replace burnt out bulbs immediately, but be mindful of the wattage you are buying. Mismatches can cause surges, sparks, and exploded bulbs. Don’t use tacks, nails, or screws – these are all sharp-edged bits that can easily pierce your electrical wiring, causing all sorts of problems. Use insulated hooks instead. Whenever you run extension cords at ground-level, take care to elevate all plugs and connectors. You can simply mount them on a brick or landscape feature. This keeps snow, water, and salt out of the connections to keep your decorations running smoothly. Never leave your Christmas lights running when you go to bed or leave the house. Unattended lights in hostile snowy weather is a recipe for disaster! Choose a location that is far away from power lines. Coming into contact with live power lines can be fatal! Place your ladder somewhere without obstruction of any kind, and make sure it is fully opened with all locking mechanisms engaged. Stay clear of any unlocked doors. Make sure that the ladder is placed on level ground. Avoid any rocky surfaces, loose or slippery substances, or wet grass. Always face the ladder when climbing. Never try to walk yourself up backwards. Make sure the rungs are dry and wear slip-resistant shoes that will create a lot of friction. Stand at or below the highest safe standing level on a ladder. For a step ladder, the safe standing level is the second rung from the top; for an extension ladder, the safe standing level is typically the fourth rung. Move the ladder as necessary to prevent the need to overreach. As a general rule, if your belt buckle crosses to either side of the ladder, then you are reaching too far. Keep the distance between the foot of the extension ladder and the wall to no more than 1/4 to 1/3 of the height of the wall that you are scaling. If any of this sounds like something you’d like to avoid, then consider leaving it to the professionals. Your Holiday Lights is a Window Genie company — the same trained, insured professionals you’ve trusted with your home’s window cleaning, window tinting, pressure washing and gutter cleaning needs will be there to get your holiday lighting done safely. Call 888-311-8882 for a free estimate.